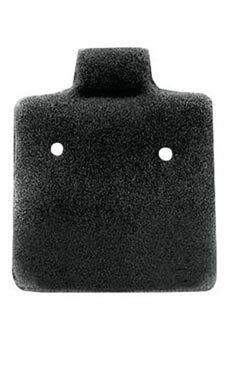 Plain Black Felt Puffed Earring Cards- 1" x 1"
Black Puffed Earring Cards are the best choice to display all types of fashion earrings. Earring cards have an easy lift tab at the top for easy insertion and removal from displayers. Each card is plain without writing. It has hole placement for post style earrings. The hole placement and tabs are spaced out allow for up to 1 pair of post earrings to display on each card.